← A Magical Moment…I Won’t Forget It Any Time Soon! One day after a testing, deciding whether a young student should pass their black belt testing; one of the other instructors said to me, “What’s the big deal, it’s “just” Taekwondo”. I have never been able to get rid of that. Maybe because I was much older and hopefully wiser. I knew my small decisions now would be more meaningful to the student later. My journey starting at 36 years of age was never “just” Taekwondo. It changed me as a person. How I viewed myself and how I felt the world viewed me back. I was always this sort of old independent sole who loved where I came from and always wanted to prove I could do anything myself. And usually do! Taekwondo gave me the means to show who I am as a person. Which is why I am at this place in time writing this piece. I was diagnosed with Breast Cancer in November 2007. I was scared for about four days between the call telling me I had cancer and the day I saw the Surgical Oncologist. The unknown factor was the hardest thing I dealt with. I wanted to be told I wasn’t going to die from this. It was truly my only concern. Then the focus was how fast can you cut this out of my body. Can you do it right here in the office. It took a lot more tests and several weeks before it got scheduled. During that time I never thought about; “I have cancer” or “why did this happen to me.” I was more clear headed then I can remember at almost any other time in my life. Get the facts, make decisions and move forward. I felt reluctant to be a student of breast cancer. But I needed the information to make good decisions. My thoughts leading up to the surgery. God I have a great life. A job, a home. A family I adore. A lot of people on my side, in my corner cheering me on. I kept being tossed back to the previous few years and used the past experience to explain to my health professionals why I was always ok. I felt I had to explain, nobody could be ok with going through this. Right! That’s what everyone kept telling me. 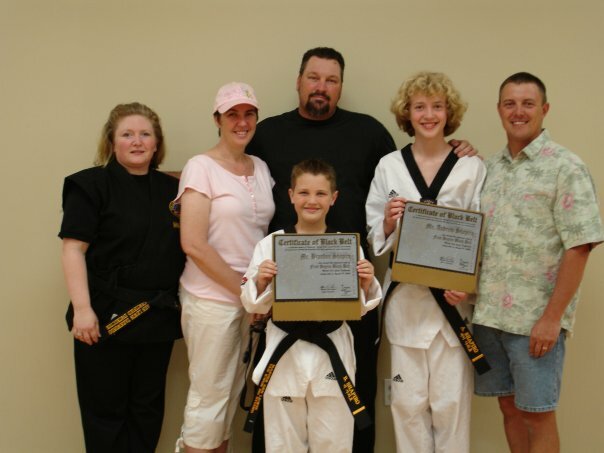 In December of 2005 I was tested as a person and a Taekwondo instructor like I had never been tested before. My hope is that this tragic and unfortunate combination of events that has come before my diagnosis lends understanding to why I feel blessed and only look toward the healing. Life is wonderful and sometimes so incredibly unjust….I knew immediately why I was involved. Now the lesson is paying me back in spades. The first week in December started out with excitement building. Testing, Banquet, all the year end fun. I had decided to honor someone I felt was a saint. Nancy Shapiro had spent years making the elementary school my children attended a wonderful place to be. Never mind a personal friend and my direct line into a school that as a working mom I always felt an outsider. I was going to honor her because I never understood why they didn’t. It was going to be a special night. I was home putting the finishing touches on awards as I usually did and Ken and the kids were already up at Robinsons Ranch, the banquet hall. Ken calls me and is explaining to me that one of our moms had been murdered. I was having a hard time letting the word murdered sink in. We were asked not to share the information because the school her children went to wanted to have a group meeting with the children that knew the family. I was now entrusted with smiling and carrying on as if this hadn’t happened. Having to clear the place settings at a table I knew the family could not show, without anyone else questioning why I was doing this. The story is a sad one of domestic violence. A murder suicide that happened as her and her children arrived home after a long day of work and school. It was on so many levels difficult to deal with. As the facts came to light I realized that my youngest, Sky, had been having dinner with them talking about having a play date at their house; twenty minutes after leaving him this mother was shot in cold blood in front of her children. Banquet was the year-end celebration it was suppose to be and my dear friend Nancy was happy and her family so proud. The next night was our monthly Bunko night. More holiday hoopla. Nancy wasn’t herself and something was definitely a miss. On Friday morning I call our mutual friend (Nancy’s sister from another mother) Brenda. I’m happy because my boss has decided to contribute money to help out the boys who lost their mother. To my shock and awe Brenda proceeds to tell me that Nancy went to the hospital last night and had a seizure before they could even see her. I’m in stunned silence. As the rest of the week played out with the funeral of the murdered mom and finding out more about Nancy’s condition; the reality verses the speculation of what was wrong became numbing. Glioblastoma; I hope no one ever has to hear that said to them and certainly not have it spelled so you can look online. After spending a day digesting what I had read I called a friend who was a brain surgeon. He agreed to talk to me if I agreed never to share with the family what he was telling me. I agreed because that’s what they had their Dr’s for. I was still a friend and would be teaching Nancy’s children Taekwondo regularly. It was very important to know the facts. 3 to 18 months life expectancy. That’s the fact. Brenda and Nancy. Most people looked at them as the same person. I never did, I liked each of them for very different reasons. Nancy would thank me for being there for Brenda. I hoped Brenda was just happy to have another friend to share with. Being a care giver is a really hard job being able to exhale is really important. I know it was hard but I think the times that were the most rewarding were when Nancy was just lost in joy or the emotion of a wonderful moment. She had an exceptional quality of life for most of the year she survived. Highly unusual for this condition. She made choices not to plan for her death. Everyday was another day her children had a mom and she was going to do everything know to man to give them one more day. As time went on Taekwondo was the family it needed to be. The safe place for this family to continue living and I mean living. Those boys earning a black belt took on a whole new dynamic and set of obstacles. The years Nancy had sat in the background had new meaning to how important the supporters of people earning a black belt are. Her kids were stoic and courageous without fail. It became a big focus. I think that the following sums up the fact that it’s not “just” Taekwondo. Failing a child at their black belt testing, knowing full well in two months their mother may not be there to see it happen; Is only magnified by the fact that the child understands and the black belt would mean nothing without having earned it. Nobody wants to be given a black belt. My life has new meaning since this year of complete and utter courage was witnessed. An opportunity to make everyday of the rest of some ones life as wonderful as it can possibly be, and we did. Nothing I face in the fight against Breast Cancer will ever feel insurmountable. This entry was posted in Uncategorized and tagged black belt, Breast, breast cancer, Cancer, Conditions and Diseases, Family, glioblastoma, Health, inspire, Taekwondo. Bookmark the permalink.